At noon on April 28: Stop-and-go traffic trying to get into Albany on Highway 20. 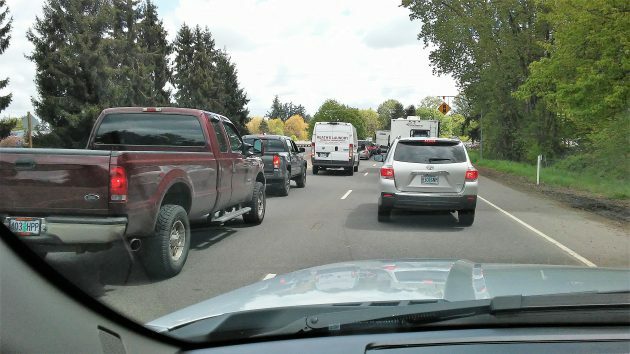 Being stuck in traffic gives you time to think about things such as: “If I was on my bike now, I wouldn’t have to sit here.” And that means legislators working on a transportation tax package are at least partly on the wrong track. One of the things they are considering is a tiny little tax on bicyclists, a 1 per cent sales tax on bikes. It’s ridiculous from a revenue standpoint. If you buy a $600 bike — entry level but still good enough to last a very long time — you pay a one-time tax of six bucks for maybe 20 years of riding. Big deal. But from the standpoint of sensible transportation policy, the state should do the opposite. Instead of taxing bikes, even just a symbolic or nuisance amount, the state should seek to boost bike transportation every way it can. And that should include finding a way to give people an incentive big enough to get them on a bike for their routine, short little trips. What would it take to get people living in and around Oregon towns to use bikes for their routine comings and goings? Climate change might help, but only if we end up with weather like the south of France, and that may take centuries. I fully agree with Herr Hering’s full-throated, unexpurgated support for pedal power. But imagine, if you dare, flying bicycles! Flying bicycles? I used to fantasize a lot about them when I was a teenager 50-something years ago. Several decades later, a very fit athlete made it across the English Channel on a pedal-powered plane. I think some combination of solar cells, pre-charged batteries, and pedal power might make it practical for those of us with lesser abilities, though it’s still going to take large wings. There you have it, one of the two big reasons for promoting bicycling (and walking and bus riding). The biggest beneficiaries of this “socialist nonsense” are the very same motorheads who resent having 1% of highway funds going to alt transport. Yet another solution will be cars with various levels of autonomous control, culminating in self-driving cars, especially on freeways. Best of all: combine all three. Then our highway funds can keep our roads and bridges in good shape instead of being spent on grotesquely expensive projects like widening Hwy 20 and replacing the Ellsworth Street Bridge. Is it time for a consumption tax? Congestion like that in the image (Noon Friday) is greatly aided by an accident on Ellsworth bridge. The wreck was cleared away and the congestion persisted, it seemed, quite a while. Your single sentence encapsulates nearly the entirety of the human condition. Just another tax to intrude on another small part of our lives. Soon they’ll be taxing the air we breathe. How about cutting spending? Where would you like to cut? Suggestion box is open.